Note: These recommendations have been optimized using Universal Human Reference Total RNA. Other types of RNA may require different fragmentation times. Modified fragmentation times for longer RNA inserts. Figure 6.1: Modified fragmentation times for longer RNA inserts. Bioanalyzer traces of RNA as shown in an RNA Pico Chip. 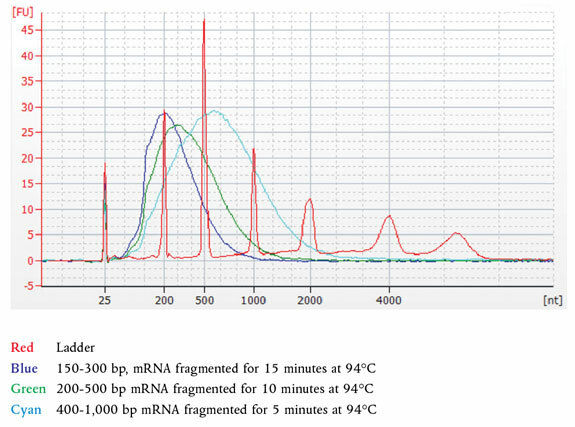 mRNA isolated from Universal Human Reference RNA and fragmented with First Strand Synthesis Reaction Buffer and Random Primer Mix (2X) at 94°C for 5, 10 or 15 minutes, and purified using 2.2X volume of Agencourt RNAClean XP Beads or NEBNext RNA Sample Purification Beads. For libraries with RNA insert sizes larger than 300 bp, fragment RNA between 5–10 minutes. Note: Size selection should be done after adaptor ligation and USER digestion. The size selection protocol is based on a starting volume of 96.5 μl. 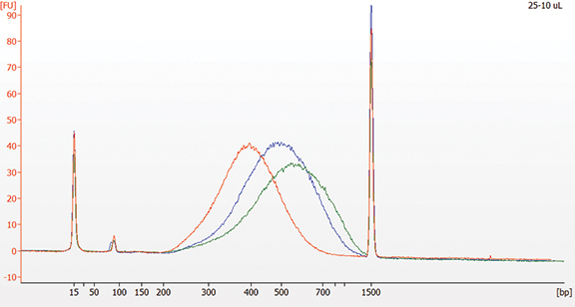 Size selection conditions were optimized with SPRIselect Beads and NEBNext Sample Purification Beads; however, AMPure XP Beads can be used following the same conditions. If using Ampure XP Beads, please allow the beads to warm to room temperature for at least 30 minutes before use. Please adjust recommended bead volumes for each target size according to Table 6.2. The protocol below is for libraries with a 300 bp insert size (420 bp final library size). Table 6.2: Recommended size selection conditions for libraries with insert sizes larger than 300 bp. Note: Size selection for < 100 ng total RNA input is not recommended. Note: Any differences in insert sizes between the Agilent Bioanalyzer and that obtained from paired end sequencing can be attributed to the higher clustering efficiency of smaller sized fragments. 6.2.1. Vortex SPRIselect Beads or NEBNext Sample Purification Beads to resuspend. 6.2.2. Add 25 μl of resuspended beads to the 96.5 μl ligation reaction. Mix well by pipetting up and down at least 10 times. 6.2.3. Incubate for 5 minutes at room temperature. 6.2.4. Place the tube on an appropriate magnetic rack to separate the beads from the supernatant. If necessary, quickly spin the sample to collect the liquid from the sides of the tube or plate wells before placing on the magnetic rack. After the solution is clear (about 5 minutes), carefully transfer the supernatant containing your DNA to a new tube (Caution: do not discard the supernatant). Discard the beads that contain the unwanted large fragments. 6.2.5. Add 10 μl resuspended beads to the supernatant, mix well and incubate for 5 minutes at room temperature. 6.2.6. Place the tube/plate on an appropriate magnetic rack to separate the beads from the supernatant. If necessary, quickly spin the sample to collect the liquid from the sides of the tube or plate wells before placing on the magnetic rack. After the solution is clear (about 5 minutes), carefully remove and discard the supernatant that contains unwanted DNA. Be careful not to disturb the beads that contain the desired DNA targets (Caution: do not discard beads). 6.2.7. Add 200 μl of 80% freshly prepared ethanol to the tube while in the magnetic rack. Incubate at room temperature for 30 seconds, and then carefully remove and discard the supernatant. 6.2.8. Repeat Step 6.1.7 once. 6.2.9. Air dry the beads for 5 minutes while the tube/plate is on the magnetic rack with the lid open. 6.2.10. Remove the tube/plate from the magnetic rack. Elute the DNA target from the beads by adding 17 μl of 0.1 X TE (provided) to the beads. Mix well on a vortex mixer or by pipetting up and down several times. Quickly spin the tube and incubate for 2 minutes at room temperature. 6.2.11. Place the tube on a magnetic rack. After the solution is clear (about 5 minutes), transfer 15 μl to a new PCR tube for amplification. Note: Size-selected libraries require 2 additional PCR cycles due to loss during size selection steps compared to non-size-selected libraries. Check and verify that the concentration of your oligos is 10 μM on the label. Follow Section 6.3.1B if you are using NEBNext Multiplex Oligos for Illumina (96 Index Primers, NEB #E6609). 6.3.1. Set up the PCR reaction as described below based on the type of oligos (PCR primers) used. *The primers are provided in NEBNext Singleplex (NEB #E7350) or Multiplex (NEB #E7335, #E7500, #E7710, #E7730, #E7600) Oligos for Illumina. For use with Dual Index Primers (NEB #E7600), look at the NEB #E7600 manual for valid barcode combinations and tips for setting up PCR reactions. **For use with Dual Index Primers (NEB #E7600) use only one i5 Primer per reaction. ***For use with NEBNext Multiplex Oligos (NEB #E7335, #E7710, #E7730 or #E7500) use only one Index Primer per PCR reaction. For use with Dual Index Primers (NEB #E7600) use only one i7 Primer per reaction. ****The primers are provided in NEBNext Multiplex Oligos for Illumina (NEB #E6609). Please refer to the NEB #E6609 manual for valid barcode combinations and tips for setting up PCR reactions. 6.3.2	Mix well by gently pipetting up and down 10 times. Quickly spin the tube in a microcentrifuge. *	The number of PCR cycles should be adjusted based on RNA input. Size-selected libraries require additional 2 PCR cycles and should be adjusted accordingly. For example if a non-size-selected library requires 8 PCR cycles, the size-selected library should be amplified for 10 cycles (8 + 2) after the size selection. **	It is important to limit the number of PCR cycles to avoid overamplification. If overamplification occurs, a second peak ~1,000 bp will appear on the Bioanalyzer trace. Figure 6.3: Bioanalyzer traces of size selected DNA libraries. 50 ng mRNA was fragmented with First Strand Synthesis Reaction Buffer and Random Primer Mix (2X) at 94°C for 15, 10 or 5 minutes. Libraries were size-selected as described in Table 6.2, then amplified by PCR, and run on Agilent Bioanalyzer DNA 1000 chip. Fragmentation times and corresponding size selection conditions are shown in the table below.